I think I mentioned that a few months ago we noticed one of Autumn's eyes was turning in towards her nose. It wasn't constant or always noticeable to those she didn't spend much time with. In fact, I couldn't really find a picture where it showed how it would cross. Still, it was there, especially when she was tired or trying to focus on something. I wanted to take care of it right away because immediately my mind started to wander to the future and kids teasing her about it in school. After a long wait, our appointment with the Ophthalmologist finally arrived this past Tuesday. He came highly recommended from friends and family and judging by the wait to see him, he knew his stuff! The Doctor had lots of toys for Autumn to keep her content! The first appointment took about 2 hours. Autumn was very good throughout, minus the trauma caused by the dilation drops later in the appointment. 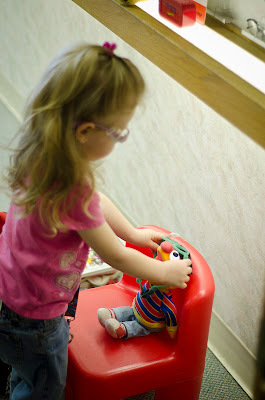 She was hesitant to talk or look at the nurses and doctors examining her at first (she's 2 - they're strangers...) but by the end of the appointment she followed the doctor's instructions and we were able to diagnose the problem. 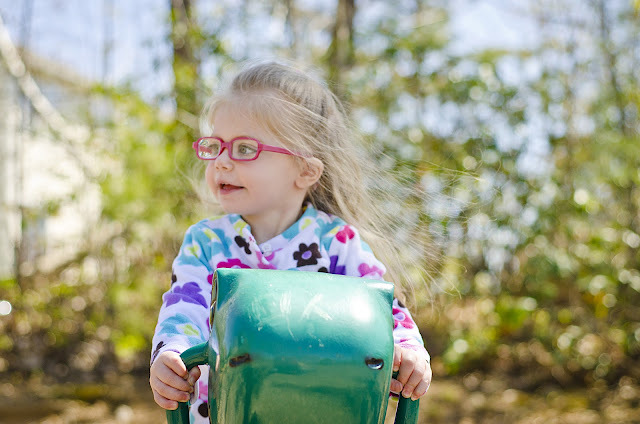 Autumn was diagnosed with amblyopia esotropia and she has Brown's Syndrome (meaning her right eye does not look up very well). Essentially he feels that her vision is probably very poor in the right eye causing her to be farsighted. 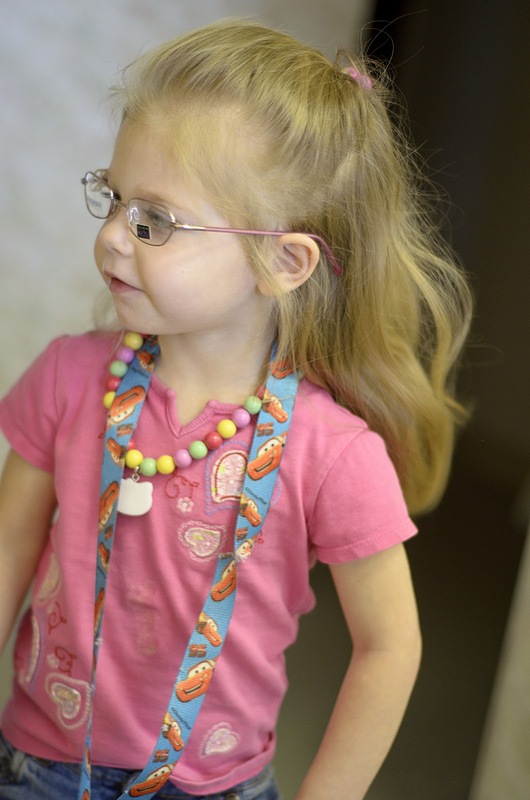 Her poor vision causes that eye to turn inward as she tries to focus, causing the esotropia. Because the vision is so blurry in the right eye, the brain has begun to "ignore" the right eye and only use images from her left eye. 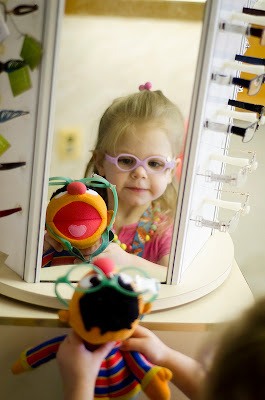 That is what is meant by the amblyopia. Ernie came along to the appointment to offer his moral support. The good news he said is that it's almost always curable and it's especially helpful I caught it this early and acted on it. 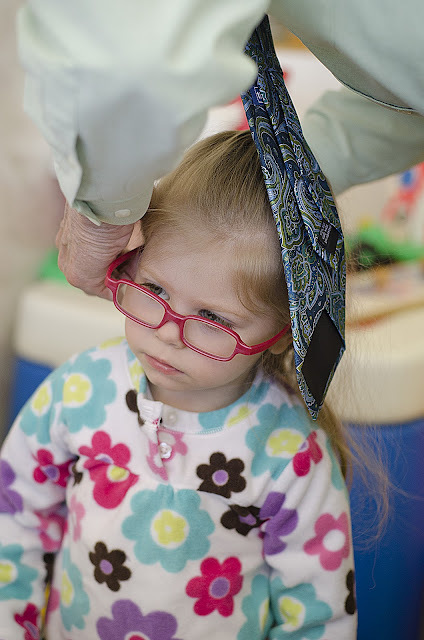 Her left eye is working very well and both optic nerves developed fine. She was probably born with this condition he said. I am trusting his medical knowledge on his description of her vision, because let me tell you - this girl can spot a spec of glitter a mile away! The treatment involves glasses full-time, which will help correct her vision and strengthen her eyesight. 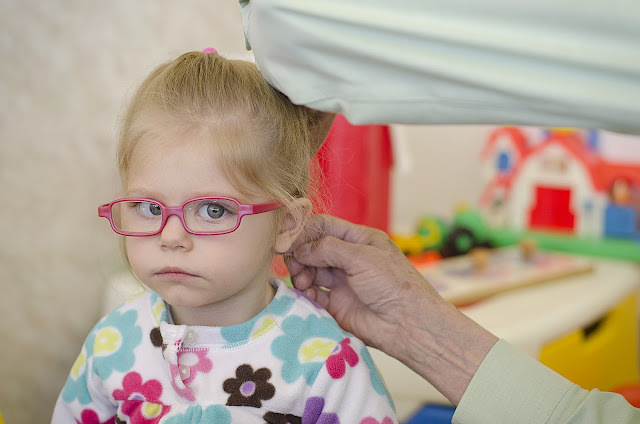 We are also to patch her left eye, or the good eye, 1-2 hours per day. This causes her brain to have to recognize the images from her bad eye and make her right eye work harder, thus correcting the issue. We go back in 6 weeks to check on her progress and Thursday we went to the eye glass place to pick out her glasses. 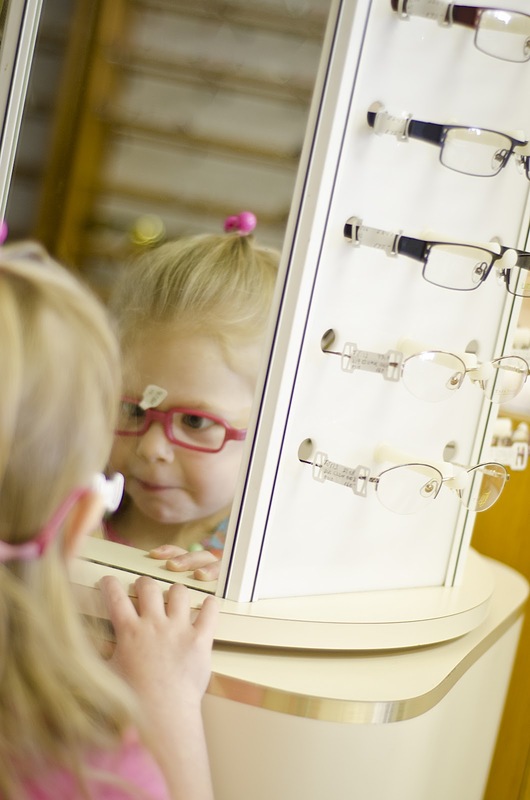 We chose this particular optician because they carry an "indestructible" line of glasses called Miraflex, that came highly recommended by the Doctor. 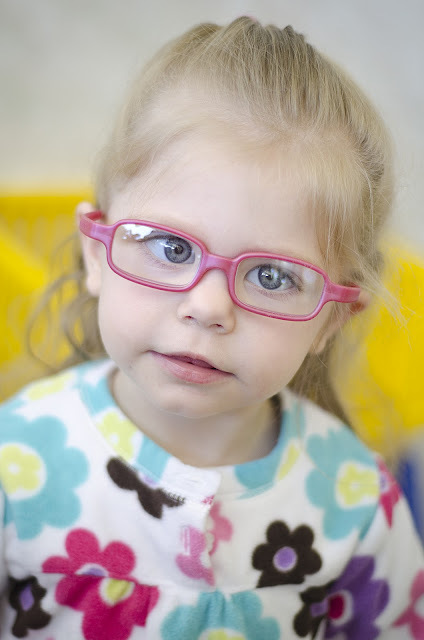 They have a variety of colors and shapes, so it was all about finding a pair that fit Autumn's personality. 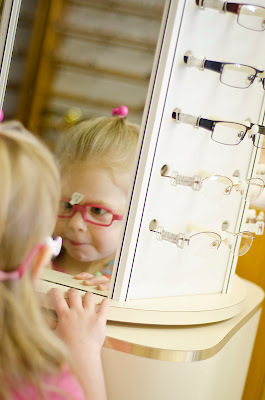 We were so surprised and excited when on Saturday morning, the Opticians called to tell us that her glasses were already in. We weren't expecting them until Tuesday of the following week, so I was especially excited to surprise Nana and Grandpa. 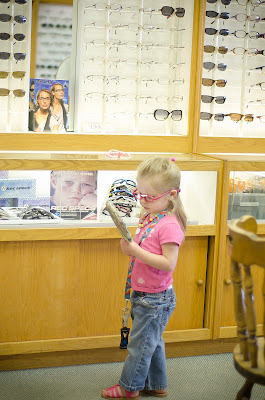 Autumn was so excited to get her new glasses - she was making everything so easy!! Ta-da! Doesn't she look so stinkin' cute? And so grown up :( Also, this is probably the best image yet of how her right eye turns slightly inward. See, not so bad right? She was so excited about her new glasses! 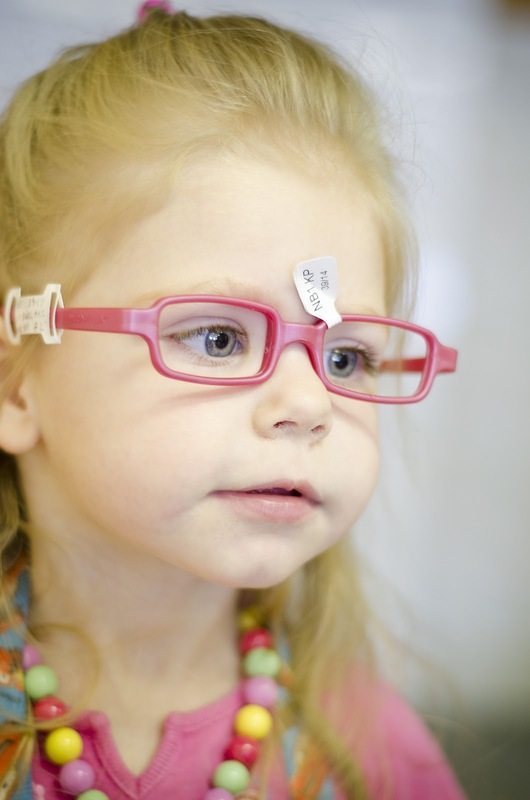 She sat perfectly still for the optician who fitted her frames for her. They have a protective band around the back to held keep them on and tight! I had the same problem with my eyes when I was little. And you can't even tell now. And you discovered hers at age 2. We didn't find out about mine until I was 3. =) My mom made felt patches for my glasses with little designs on them. 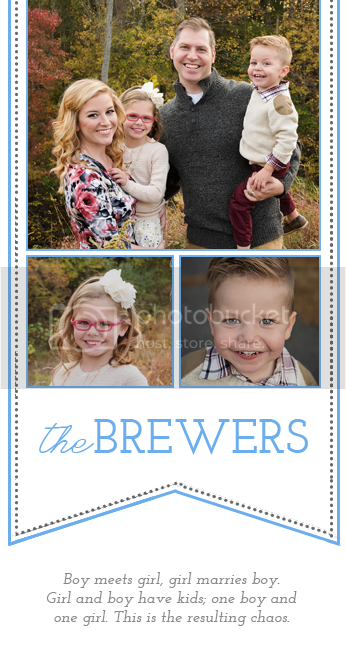 They were really cute. If you'd like I could find out what she did to make them.